Traditions create memories and a sense of belonging in a family. Here are some of our Christmas traditions -- many I'm sure you've heard of before, but some are unique to our family. ~ The kids get pajamas each Christmas Eve and an ornament each Christmas. ~ On Christmas Day we read the story of Jesus's birth and re-enact it with our nativity set. We have the Little People nativity set by Fisher Price that the kids can play with (and there's no chance of it breaking!). ~ At some point during the Christmas season we drive around and look at Christmas lights in our community. Our newspaper has a list so we can spend a night driving around and looking at the most impressive ones. Last year we found one that was timed to music on a radio station! ~ We set our fake Christmas tree up in the backyard and then we go search for a Christmas tree to "cut down". This year we walked all over the neighbourhood admiring the Christmas lights before we found the perfect tree right there in our own backyard. Next year I might "plant" the tree somewhere else to add to the excitement. ~ I take the kids stocking stuffer shopping at the dollar store where they can each buy a couple presents for each family member's stocking. The kids are able to practice the art of giving by thinking of what each person would like (and because we're at the dollar store it doesn't cost too much of our money!). Two years ago, Elijah (then 2 1/2 years old) bought me a red train for my stocking. Once Desiree bought Daddy a set of water paints so that he could paint with her and a pair of work gloves. It's so neat to see what they come up with. I love that the kids have the opportunity to give. By having them do the choosing, wrapping and sneaking around, I hope they're learning that "It's more blessed to give than to receive". They sure have a lot of fun, that's for sure! We also let Munchie pick out a gift for each parent. Last year Hubs got dinosaurs to play with (she was concerned that all we had was girl-toys). This year she's convinced that he needs underwear. What you do with the Christmas tree sounds really creative! We used to do the dollar store gift shopping with our youngest when she was little. It was always fun seeing what she could come up with. I hope you and your family have a wonderful Christmas. Our favorite Christmas movies are 'It's a Wonderful Life', 'A Christmas Carol', and 'The Bishop's Wife' (the one with Carey Grant) Blessings! Lyndsay, how cute that Munchie got your husband dinosaurs! Does he play with them often? Jodi, I have never heard of "The Bishop's Wife" -- I'll have to check it out! Do you have a favourite "Christmas Carol"??? I love your list Chelsey. We wanted to start a new tradition where we go to a tree farm to get our Christmas tree. My husband researched and the trees start at $40 plus it's sooo out of the city. Gosh, no wonder it's a money making holiday. It is illegal for us go go and chop down a tree in our neighbourhood, park or woodlot.... which makes sense. So I don't know about this tree farm. I think it might end up being a tree from Ikea - they offer a gift card for each purchase - so the tree ends up totally free ;D I don't know, it's just a tree that you end up throwing out. I'd rather have the money go someplace that's more in need..... or IS the experience worth it????? I am also intrigued by your Christmas tree tradition. How did you start putting your fake tree outside? Love your christmas tree tradition! Some of your traditions sound similar to ours but on christmas eve, we are usually scrambling around putting together toys and cursing at terrible directions. Your xmas eve sounds much more peaceful! Abi, In 2008 I thought it would be fun to put the tree outside (I recruited my husband to do this and he willingly played along). Then after when the whole family went to the garage to get the tree, the box was empty and the tree was gone!!! The kids (2 and 5 then) were so disappointed that our tree was missing until we said we were going to go find one to cut down. That year we went straight to our backyard and there it was. My husband even took an old hacksaw and put a string on it as the blade and the kids took turns cutting it down. The last two times we've incorporated a walk. This year Desiree(7) said as soon as we went into the backyard "I know the tree is in the backyard!" But, traditions are predictable and that's part of what makes them fun. Julie, It sounds like you buy complicated toys! lol... On Christmas day we open presents really slowly. Toys get assembled that day and then played with for a while before another present is opened. Movies are watched, clothes are worn, games are played -- whatever the present is. That was my mom's tradition originally because she would only have some of the presents wrapped. She needed breaks throughout Christmas day to continue wrapping things! Seriously! (but in her defense this was before bags were popular). I have kept the tradition because I like the slower pace and like having time to appreciate each gift. I had no idea Little People made a nativity set; that is so awesome. What a great way to help reinforce the events of long ago that we celebrate; making it really come to life. I'm going to track down a set for us. Merry Christmas and thank you so much for your encouragement!!! 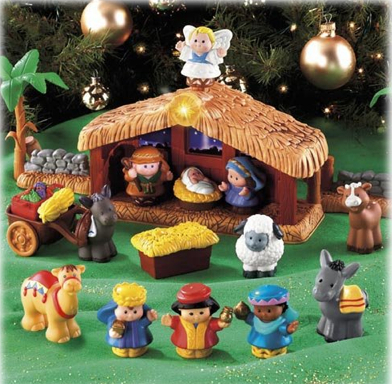 Jenn, The Little People nativity set is so sweet and when you push the star it plays the tune "Away in a Manger". At our house other Little People characters often come to worship Jesus too! Merry Christmas to you too (and you're welcome).